Angaja or Angiraja (Skt. Aṅgaja, or Aṅgirāja; Tib. ཡན་ལག་འབྱུང་, Yenlak Jung or Yenlak Kyé; Wyl. yan lag ‘byung, or yan lag skyes) — one of the Sixteen Arhats. 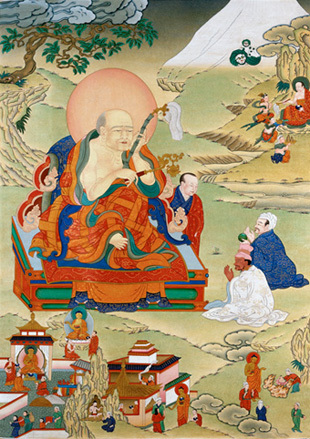 As a householder Angiraja was immensely wealthy and gave away all his wealth seven times, but he realized his riches only caused jealousy and dispute. Distributing everything he had, he asked the Buddha for ordination and joined the Sangha, later becoming an arhat. Angiraja now dwells on Mount Kailash with a retinue of 1,300 arhats. On this sacred mountain the Buddha explained the law of karma, setting beings of all realms onto the path of liberation. He holds a fly whisk and an incense bowl; smelling the incense or touching the fly whisk grants the sweet fragrance of shila (self discipline) which liberates beings from all manner of emotional pain. This page was last edited on 5 August 2017, at 08:51.